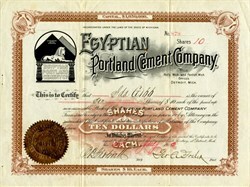 Beautiful certificate from the Egyptian Portland Cement Company issued in 1903 This historic document was printed by the American Banknote Company and has an ornate border around it with a vignette of the company's logo. This item has the signatures of the Company's officers. This is the first time we have seen this certificate for sale. During the year 1903, Portland cement was made in Fenton, Michigan, by the Egyptian Portland Cement Co. During the year the company had employed on an average of 85 men, this being the second year they have been in operation. Marl is used as a basis, using about 20 per cent clay. The company had increased their annual output to a great extent over that of their first year and yet they expect to install additional machinery later. About 70 per cent of the entire product of this plant was sold in Michigan. The company has marl holdings sufficient to continue in operation for one hundred and fifty years. I. F. Williams, of Detroit, Michigan, was the General Manager.